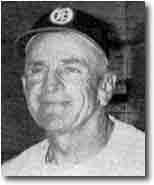 Charles Dillon "Casey" Stengel has been in baseball 36 years. He is 5' 10", has grey hair, agate eyes, throws left and bats left. The umpire baiting Manager of the Oaks is a showman of the diamond and is noted as one of the best story tellers of the sport. During his playing days, Stengel--a fast, hard-hitting outfielder--was with the Brooklyn Dodgers, Boston Braves, and New York Giants. He began his managing career in 1934 with the Brooklyn Dodgers and later taking over for the Boston Braves. In the big leagues, Casey's teams never finished better than fifth. He was fired by the Braves after the 1943 season, and his career as a manager appeared to have come to an end. Then, in 1946, he came to Oakland to manage the Oaks. Ol' Case has presided over an unforgettable era of Pacific Coast League baseball. Oakland fans could not remember when their team had last won a league championship. But in 1946, the Old Perfessor had brought them up to second place. The following year they only finished fourth, and it looked like they were on their way back down to oblivion, until 1948, when in Billy Martin's rookie year, Casey led the Acorns to their first Pacific Coast League pennant in 21 years. Del Webb Comes to Town. The story of how Casey Stengel went to the Yankees. The baseball cards below show the old perfessor as manager of the Oakland Oaks in 1946 -'48.